Shortly after the conquest of Uotila began, I spent some time doing a bit of a "meet and greet" with the local ice miners. Things went amiss. Many of these miners were AFK, so it was quite difficult to meet and greet them until after they returned to discover their mackinaws had been bumped out of mining range. Miner Sherlock Aubrey wanted to know more about the Code I was enforcing, so I politely informed him of his new responsibilities as a New Order resident. Unruly miners tend to lack creativity and recycle the same set of lines and excuses all across highsec--so much so that I created Miner Bingo to help Agents make lemonade out of the lemons. 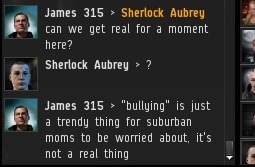 References to bullying are common, but Sherlock put a new twist on it. This seemed to be some kind of equivalent to getting out of school with a doctor's note. Only without a doctor, or a note. I was skeptical. I had not heard of many school children enforcing the New Halaima Code of Conduct. Perhaps it was a parochial school? In reality, the only "bullies" are those who attempt to throw their weight around and act like they are above the rules. 'Tis the primitive doctrine that might makes right. The New Order stands against this philosophy on principle. The New Order also has more might than anyone else! That seemed to do the trick. Sherlock realized discretion was the better part of valor and docked up. 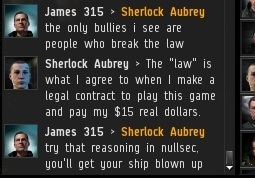 I didn't get my 10 million isk from him, but that's something to work on in future sessions. The inherent bullying nature of people who refuse to follow the Code is disturbing, and perhaps part of a trend in our ice fields. 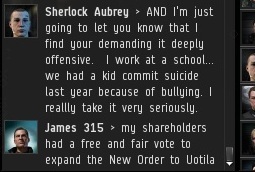 As supporters of the New Order, it's our job to keep highsec a safe, welcoming environment for everyone. As always, the Code shows us the way. James keeping hisec safe is like USA keeping Native Americans safe. You should also look up what bullying is. Just don't go AFK while mining. Pretty simple if you ask me. Not sure where you're going with that Native American analogy. Clarify? James is the second coming of the lord. It was spoken in the bible, in the Book of James, Verse 3, Line 15. "Rejoice he who toils meaninglessly, a slave to themselves and their menial tasks. Pounding fist and tools against hard stone and ice, will be liberated under the aegis of their savior and protector; James315"
Anyone care to take bets on how long it takes James to reach the top of the bounty list after December 4th? 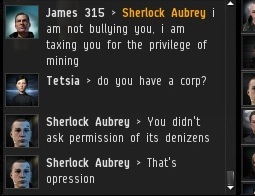 Every disgruntled miner in Highsec will be putting a bounty on him lol. this article is over a year old, the time for the bounty to be collected "Soon" has long since passed already.